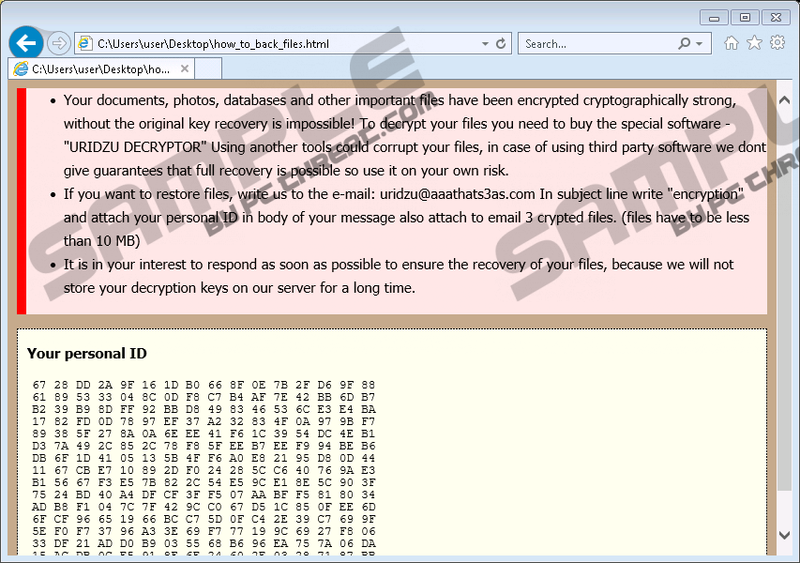 If original extensions of a bunch of your personal files have been changed to crypted_uridzu@aaathats3as_com, it is a clear sign that Uridzu Ransomware has infiltrated your computer and mercilessly encrypted your files. There is only one reason why ransomware infections lock files on victims’ computers – they try to help cyber criminals to obtain money from them. Uridzu Ransomware is one of those ransomware infections that do not tell users the exact price of the decryption tool. They are only told that they “need to buy special software – “URIDZU DECRYPTOR”” to unlock those locked files. We suspect this tool might be quite expensive, so, in our opinion, there is no point in contacting cyber criminals by the given email address. Instead, you should focus on the Uridzu Ransomware removal. This malicious application does not drop any additional files on users’ PCs, but it is still very important to remove all its components from the system because it might be accidentally launched again by double-clicking on the malicious file, a.k.a. its launcher. In such a case, even more personal files will be locked. We are sure you do not want this to happen, so we suggest that you fully erase this threat today. If Uridzu Ransomware ever infiltrates your computer, it will lock the majority of your personal files within seconds. Files it affects are various pictures, music files, text files, videos, and much more. It only leaves important Windows and system files intact. This shows that it does not want to ruin users’ computers. When files become encrypted and get the crypted_uridzu@aaathats3as_com extension (e.g. picture.jpg becomes picture.jpg.crypted_uridzu@aaathats3as_com), Uridzu Ransomware drops an .html file called a ransom note. This file (how_to_back_files.html) explains to users why they can no longer access the majority of their personal files: “Your documents, photos, databases and other important files have been encrypted cryptographically strong.” Also, users find out that they need the special decryptor to be able to unlock these encrypted files. Users are not going to get it from crooks for free. They, first, need to send 3 encrypted files and the personal ID provided at the bottom of the ransom note to uridzu@aaathats3as.com. Most probably, the answer sent by cyber criminals will contain the exact amount of money users need to send in exchange for the decryptor indicated and payment instructions. Ransomware infections are programmed to lock victims’ files using strong ciphers, so it is usually extremely difficult to restore files without the special decryptor; however, it does not mean that you should purchase it from cyber criminals because you might not get anything from them after sending money. Needless to say, you will not get your money back in such a case, so, in our opinion, you should not even think about paying money to crooks behind Uridzu Ransomware. We suspect you do not know anything about the entrance of Uridzu Ransomware because it acts just like other ransomware-type infections – it usually slithers onto users’ computers without their knowledge. It might pretend to be an ordinary application to convince users to download it, but, according to researchers working at pcthreat.com, it should still be mainly distributed via spam emails. Not only ransomware infections can slither onto your computer if you keep opening all email attachments you get, so there is only one piece of advice we have for you – you should not open emails whose senders you do not know. Additionally, it would be smart to have a powerful antimalware tool installed on the system because malicious applications are becoming more and more sophisticated, and it is not always easy to prevent them from entering the system. An antimalware scanner you use must be trustworthy, and, on top of that, you must enable automatic updates so that it could protect you from all the newest threats. If your files have already been locked by Uridzu Ransomware, it might be impossible to unlock them for free because it uses a strong cipher to lock data on victims’ computers. Luckily, you can still protect those files it has not affected yet by erasing this ransomware infection from your system. You should not find its removal complicated because you only need to remove all suspicious recently downloaded files from your PC. Since it does not drop any additional files, you need to erase its launcher. If it happens that you cannot find it anywhere, use a reputable antimalware tool to scan your system. Press Win+E simultaneously to open Explorer. Open these directories one by one (type the directory in the URL bar at the upper part of you Explorer to open it): %USERPROFILE%\Desktop, %USERPROFILE%\Downloads, and %TEMP%. Delete the ransom note how_to_back_files.html. Quick & tested solution for Uridzu Ransomware removal.